One of Australia’s hottest exports Badboys Australia has been taking the world by storm. Well they’re back, still “the ultimate ladies night out” unleashing their brand new production for 2019. Taking you on a journey through the ages, celebrating some of the worlds greatest artists, actors and performers. Our all Australian Male Revue is set to sizzle as the boy’s take to the stage with dynamic dance routines, dazzling acrobatics and sensational costumes. 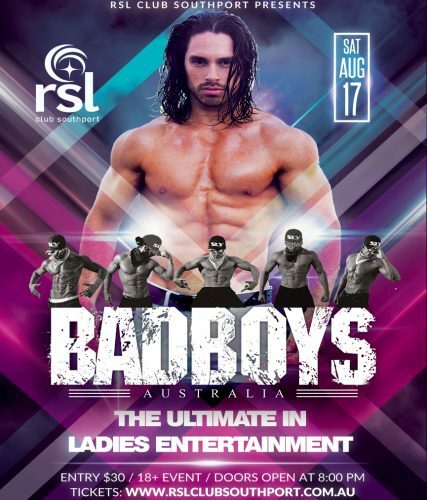 Badboys Australia have been entertaining ladies of all ages, the globe over for the past decade, creating a devoted fan base of excited woman – Millions of ladies can’t be wrong, they all love a Badboy!!! Error: Error validating access token: Session has expired on Saturday, 02-Feb-19 17:58:11 PST. The current time is Saturday, 20-Apr-19 03:10:51 PDT.